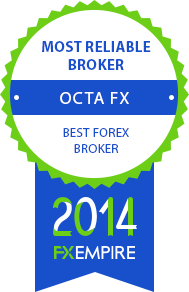 OctaFX is proclaimed Most Reliable Forex broker 2014 by FX Empire! The voting took place at FX Empire website and lasted for one month! We would like to thank FX Empire readership and our clients for the support shown. In FX Empire words, “reliability is paramount in online retail trading. This award marks security, platform performance and general reliability and trustability”. OctaFX is happy to be recognised by this Forex-themed portal second year in a row. “We are honoured to receive this award - public votes decided the winners, and to our team there’s nothing more valuable than the fact that we are trusted by our clients and FX Empire audience”. FX Empire Network covers the field of Forex trading and developed most expert opinion on any topic connected with financial decision-making. FX Empire award announcement states: “The rapid growth which this broker has seen may be attributed to its strive for perfection. This is displayed no less than through its list of security and reliability measures, which is what truly marks this broker as a forerunner for the award”. As a response to this highest evaluation of our services, we would like to confirm that we put all our efforts into creating comfortable trading environment and overall positive image of OctaFX. We would like to inform you that we will be performing a scheduled server maintenance this Saturday, March 7 from 10:30 till 13:00 Server time (EET).